I concocted this little recipe a few years ago, and now, for the first time I’m putting it down on paper. I had other plans for dinner this weekend, but this just sounded better and I haven’t made it in a while. Plus, the kitchen is closing early tonight in order to be ready for the season premiere of Mad Men!!! I’m excited but also irritated that they’re copping out and splitting the final season into two seasons. Greedy much? Gah! Anyway….back to the food. I love pad thai, it’s really versatile and you can probably make it a hundred different ways. My brilliant idea was turn it into a pizza. It’s got all the same flavors and ingredients as pad thai, just not the noodles. (And no scallions either because I hate those, so include them if you’re into that sort of thing). Once it’s all pulled together, it’s going to be a bit of a mess to eat. Keep a fork handy! PS – this peanut sauce is really good and could be used for any other recipe that calls for peanut sauce. 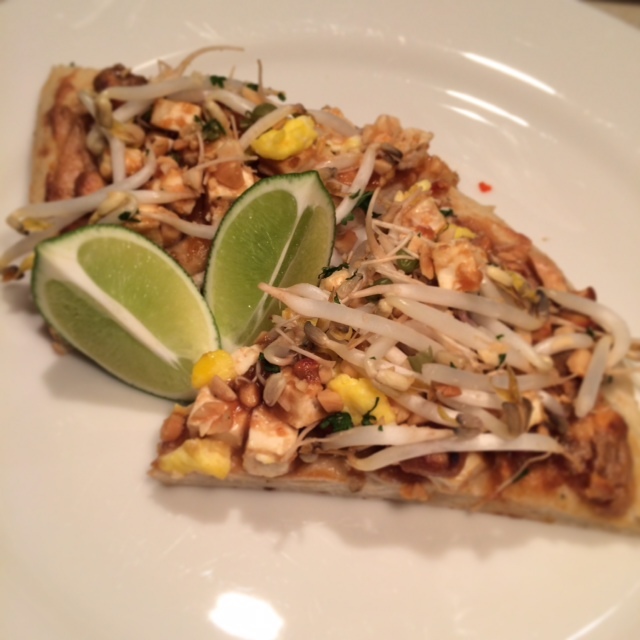 The peanut sauce is going to be your base, so mix to incorporate all ingredients and spread it over the pizza crust. Toss the tofu in what’s left of the sauce. Throw the tofu on top of the pizza and cook according to crust package ingredients. While the pizza is cooking, scramble the eggs, set aside. 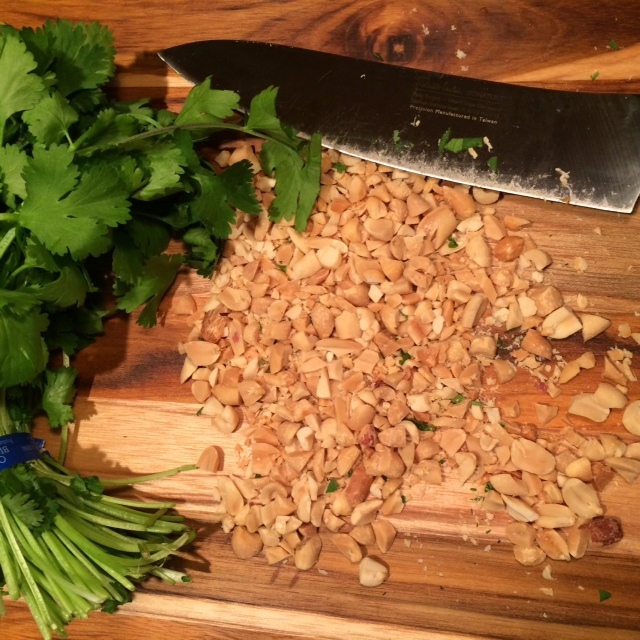 Chop the peanuts and the cilantro and mix them together. When the pizza is out of the oven, top with (in this order) the scrambled eggs, sprouts, then the peanuts and cilantro. Squeeze lime over pizza before serving.